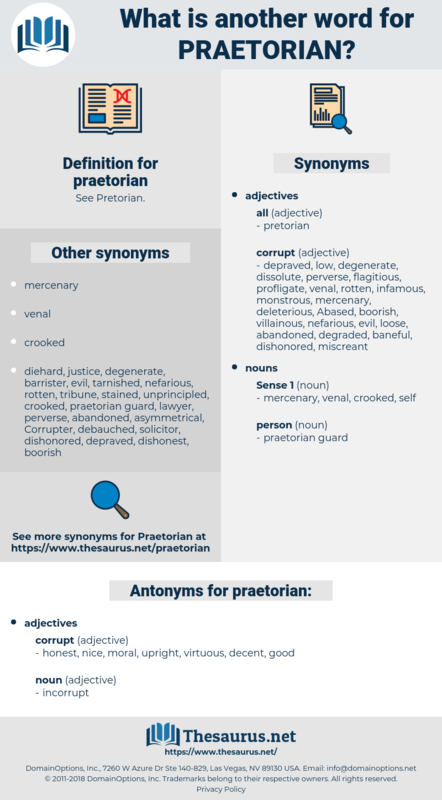 What is another word for praetorian? honest, nice, moral, upright, virtuous, decent, good. 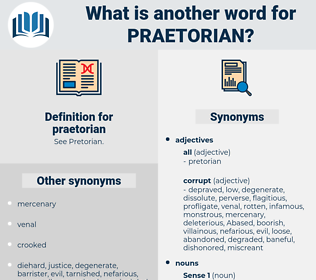 So, too, the action for theft detected in the commission, though praetorian, is perpetual, the praetor having judged it absurd to limit it by a year. Much was said about Pisistratus, Timophanes, Dionysius, Agathocles, Marius and Sylla, Julius Caesar and Augustus Caesar, Carthage besieged by her own mercenaries, Rome put up to auction by her own Praetorian cohorts, Sultan Osman butchered by his own Janissaries, Lewis Sforza sold into captivity by his own Switzers.